Supplementary material reads: "Ward club photo assignment for Wednesday, November 13 at 3:45 p.m. Home of Mrs. Aubrey Leach, 175 North Highland avenue, WE 53972. Picture is of Mr. Leach and one other member of Carthay Women's Club, preparing for annual bazaar (for Children's Hospital) to be held Dec. 4. 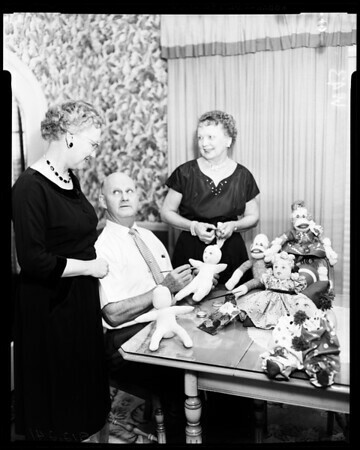 Mr. Leach is in picture because he has, for years, painted the faces on rag dolls the women make for bazaar, and has made other doodads for the bazaar. Get picture of him painting...".